Industrial Strength Samples sends another fierce jolt of ear-bending EDM Presets specially designed for the almighty NI Massive. EDM Massive is loaded with deep Bass, fierce Leads, and completely mental presets. This pack delivers a clean, up-front, Hardstyle sound ready for the Big Room. This slammin set of presets is a go-to for producers looking for that harder EDM sound. Rev up these presets in Big Room, Hard Dance, Electro, Hardstyle, Techno, Raw Style, and any EDM sub genre. These otherworldly presets were produced by French sound designer Floxytek, whose passion for electronic music and studio wizardry lent to the perfection of every detail you'll hear. As a seasoned producer, Floxytek's name has graced more than 100 vinyl releases, and his sound designer's touch has earned the crowds of some of Europe's biggest venues. Floxytek continues to break ground with a series of totally unique Industrial Strength packs. 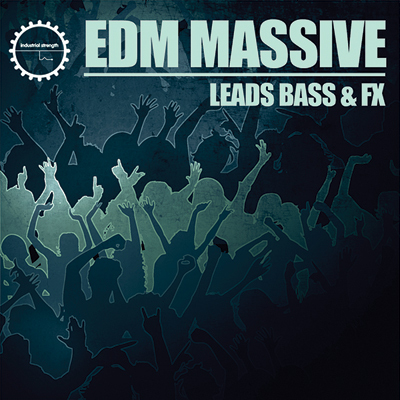 EDM Massive makes a mean pair with Floxytek's EDM Sylenth and EDM Production Tool Kits pack. Combine them for boundless potential. Grab these heavy packs and get ready to send your tracks into EDM deep space. +You must own the latest copy of Native Instruments Massive to use this pack.